The RICOH IS760/IS760D Image Scanner Series swiftly enhances document workflow in your office, so you work more efficiently. This sleekly designed Flatbed Color Scanner with a standard Document Feeder provides unparalleled image quality and reliability, whether scanning color or black & white documents. Combined with advanced image processing features and versatile paper handling, you achieve the perfect balance of performance and quality. Includes Scanner, Quick install guide, CD-ROM, AC power cord, Tool, Cleaning cloth, Two caps, Instruction sheet. * This scanner tackles simplex scans at a swift 40 ppm color and 75 ppm black & white. * The IS760/IS760D Image Scanner Series intelligently perfects the art of outstanding image quality with state-of-the-art CCD technology, sharp 400 dpi optical resolution, and 75~800 dpi output resolution available for color and black & white. With some image enhancement applications, customized dpi settings are required; the IS760/IS760D Series one-dpi- step capability ensures that those customized settings are realized. * With the IS760/IS760D Image Scanner Series, performance reliability and flawless paper handling of mixed originals are second to none. * High paper feed reliability of 11 lb. to 42 lb. Bond also sets the IS760/IS760D Series apart. The standard 200-page Automatic Document Feeder effortlessly feeds diverse originals, such as card stock. * Ultrasonic Double Feed Detection delivers reliable document feeding with less double feeding of mission-critical documents. In addition, because the IS760/IS760D Series boasts a more durable design than other scanners in its class, the feed rollers never have to be replaced, ensuring uninterrupted performance. * Flexible Connectivity. Because the IS760/IS760D Image Scanner Series supports standard SCSI-3 and USB 2.0 as well as the optional Network Interface Box, IEEE 802.11b Wireless LAN and IEEE 1394, you will experience easy installation, optimum throughput, and high-speed connectivity. * The IS760/IS760D Series comes standard with TWAIN and ISIS drivers for greater flexibility for virtually any scanning application available on the market today. The latest Ricoh TWAIN Driver improves how image data appears in documents by allowing you to combine two or four pages of scanned documents to create a single image or divide them into two images. Standard QuickScan software transforms scanned images from printed pages into usable content, enabling easy integration into applications using TIFF, JPEG or Bitmap formats. * The optional Network Interface Box opens up your workgroup to the world of network scanning with sophisticated features like Scan-to-E-Mail, Scan-to-Folder, Scan-to-Print and Network TWAIN, which maximize the IS760/IS760D Series functionality. - Auto Photo/Letter: Automatically adjusts individually for text and photos and then saves the file with the correct image quality settings and appropriate file size. - Dynamic Threshold: Automatically adjusts the contrast of variable backgrounds so data is more readable. - Select Area: Lets you select and set scanning conditions for a specific area on an original. 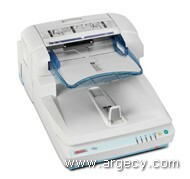 SOFTWARE - Includes QuickScan, Ricoh ScanRouter Lite, and Ricoh DeskTopBinder. DIMENSIONS - 19.6" x 27.8" x 13.3" WT.- 68.2 lbs.